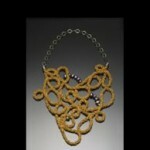 A metalsmith and fiber artist based in St Louis, MO. 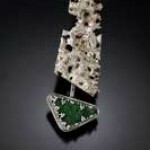 Jewelry is inspired by a passion for art, architecture, icons from past cultures and patterns in nature. Two concepts, an appreciation for beauty and individuality, have had the greatest influence on what I do and who I am. They have shaped the way I look at the world and helped me to grow as a person and as an artist. A passion for art, architecture, icons from the past and patterns in nature has taught me to see and appreciate beauty. To me, beauty stems from the selection of materials; the arrangement of elements; and the weaving of textures and colors in each piece of jewelry I design. My unique style allows me to create beautiful pieces with a contemporary aesthetic. Each design is a wearable work of art, an elegant personal adornment.